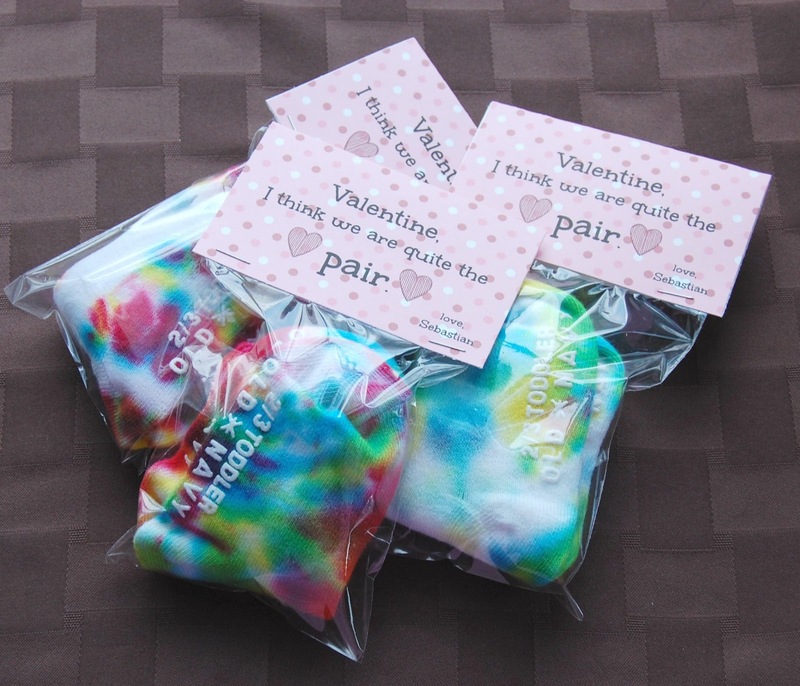 It’s nearly Valentine’s Day again, and even though my two boys (yes plural!, if you want to see my new one, check out this post) are too young to care about handing out valentines, I was on the hunt for something that I would feel good about giving to their friends. I found a lot of cute ideas, which you can see on my Pinterest board, but what I decided to go with was actually from my own mind. This year, we are giving out socks! I am always in need of a good pair of socks that won’t fall down, and I absolutely love these socks from Old Navy. They aren’t too expensive, a dollar or less a pair (depending on if you get it on sale or not), and they don’t fall down. Hooray! I thought plain socks would be boring, but truthfully, boring socks are much more useful, so don’t feel bad stealing this idea but just using plain socks. So to jazz it up, I decided to tie dye with my toddler. It’s not as scary as it seems, and Sebastian actually didn’t really want to participate, so I ended up doing most of the dyeing. But Sebastian did enjoy getting to wear them afterwords! So here’s how I did it. I basically just followed the instructions included in the tie dye kit I got. I went with the dye that called for you to presoak in a solution to maintain the dyes’ colors since the socks I got were not completely cotton and I wanted vibrant colors. It seemed to work out really well. So I soaked, and then I paired up the socks, tying and twisting and securing with rubber bands. I just did one sock put right next to it’s pair before I rubber banded it. This worked out fine, but the resulting socks weren’t an exact match. But you can tell that they went together. I think if I were to do it again, I would put one sock inside of the other. That way you would be more likely to make matching socks. But in the end, I had to remind myself that this was supposed to be done by a toddler, who doesn’t much care about matching, so it’s all good. So back to the steps, after twisting and securing, we squirted it with dye. Then wrapped them in saran wrap for at least 12 hours. Then I rinsed them out. And threw them in the washer and dryer. And ta-da! Then I made these little tags (that you can download here if you’d like), put the socks in a bag, and stapled it shut. I’m pretty happy with how it turned out, and I’m looking forward to giving them away. If you need more ideas for valentines, don’t forget what I made last year, and be sure to check back this week for more ideas! Previous story Grow: My Family Grew!